The New Fast Automatic Daffodils (commonly shortened to New FADS) were an alternative rock band which formed in Manchester, England in 1988. The band consisted of Andy Spearpoint (vocals), Dolan Hewson (guitar), Justin Crawford (bass), Icarus Wilson-Wright (percussion) and Perry Saunders (drums). 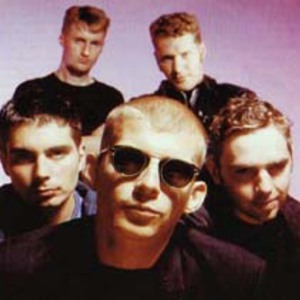 The band's unusual sound included dark and intense elements, influenced perhaps by Joy Division or The Fall, coupled with a funkier, dancey feel reminiscent of the Happy Mondays. The band split in 1995. The band released several singles and E.P.s between 1989 and 1991 on Playtime and Play It Again Sam followed by a debut album Pigeonhole in 1991. This album included the single tracks Get Better, Fishes Eyes and the enigmatic Big. During this period their live shows, particularly in the North West, attracted a fanatical following. The band's second album was Body Exit Mind, released in 1993. This included the powerful songs Stockholm and It's Not What You Know, both of which were released as singles. Although both of these singles and the album gained critical success in the UK music press, there was no breakthrough commercial success for the band. A later album, Love It All was released in 1994. The band broke up in 1995.Justin Crawford has subsequently DJ'd and produced electronic music as part of Only Child and the Unabombers.